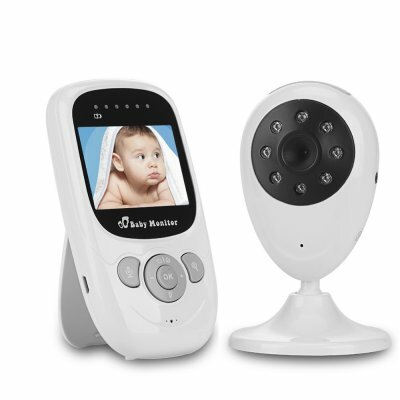 Successfully Added 3MP Wireless Baby Monitor - 2.4 inch LCD Screen, 100 Meter Range, Two Way Audio, Night Light, 1/3 Inch CMOS Sensor to your Shopping Cart. This wireless baby monitor operates on a 2.4GHz frequency that supports cable-free communication over distances up to 100 meters so you can keep a close eye on your child as they sleep no matter where you are in the home. A built-in night light can be programmed to come on once the lights go out or turned on and off direct from the receiver should you need to look in on your child without disturbing them. Powered by a 400mAh Li-polymer battery the receiver has a 2.4 inch TFT LCD screen and gives you live feedback from the IP camera. Providing room temperature readout and letting you listen in and talk via the VOX two-way audio transmission you can keep an ear out for any disturbing sounds and provide comfort whenever needed. Quick and easy to install this baby monitor can be set up with the push of just one button to pair the camera and receiver. The camera comes with a ball and socket stand that can sit on a cabinet or be mounted on your wall. able to rotate through 360 degrees horizontally and tile through over 90 degrees you won't have any problem mounting it out of arms reach but still capturing the area you need. With a 1/3 inch 3MP CMOS sensor as well as5-meterr night vision you will receive crystal clear images night or day. With this wireless baby monitor, you can watch TV, finish the chores, exercise or even step out to hang the washing or relax in the garden and take a view of the baby's room with you for greater peace of mind. This 1/3 inch wireless baby monitor comes with 12 months warranty, brought to you by the leader in electronic devices as well as IP cameras and baby monitors..
View Angle 80 Horizontal 100 Vertical Degree.